Garbh Eileach is an uninhabited island in the Inner Hebrides of the west coast of Scotland. 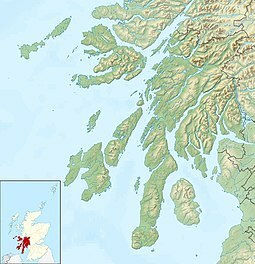 It is the largest of the Garvellachs and lies in the Firth of Lorne between Mull and Argyll. The name is Gaelic for "rough rock". The Anglicised version of the name gives the whole group of islands its name, the Garvellachs. There is a small ruined fort above a bay on the eastern coast. ^ Pallister, Marian (2005) Lost Argyll: Argyll's Lost Heritage. Edinburgh. Birlinn. Page 133. Wikimedia Commons has media related to Garbh Eileach. This page was last edited on 11 December 2016, at 22:02 (UTC).